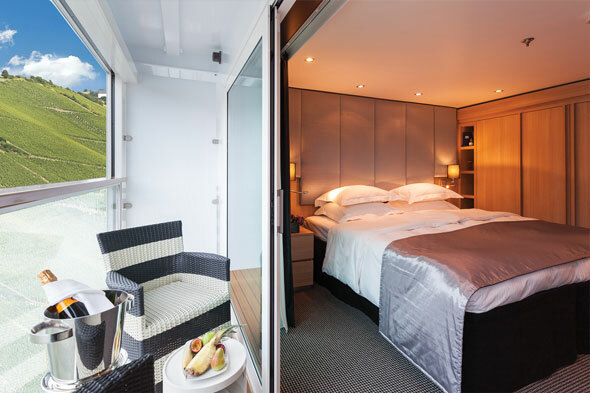 There’s a warm and wonderful feeling and a lot of glass in the private conservatory of my suite on board Scenic Jade. As I relax, admiring the views of the Danube, I think I could almost grow tomatoes here if I were sailing for a little longer. 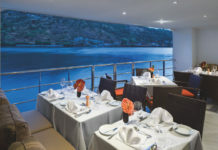 Scenic Jade is the eighth of Scenic Tours’ ‘Space Ships’, and sailing from Amsterdam to Budapest gives you plenty of time to experience their brand of luxury, all-inclusive river cruising. The entire wall of my suite is glass; at the touch of a button the top half slides down creating a balcony that you can see through. To the back of the balcony-conservatory is another transparent wall cutting it off from the room at large. But the glass door and the rest of the wall folds away, opening the whole place up to the balmy weather outside. Almost as exciting is the roomy shower cubicle which, with the (disappointingly normal) bathroom door open, allows for river views. Possibly from the river, too. But it doesn’t end there. The shower has various heads, one which sprays your belly button, and then there are the lights – a button gives you the option of bathing yourself in blue, green, or orange or in a flashing combination. With the help of the volume turned up on the iPod dock by the bed I could have my own disco, while the golden glow would do wonders for the tomatoes at night. 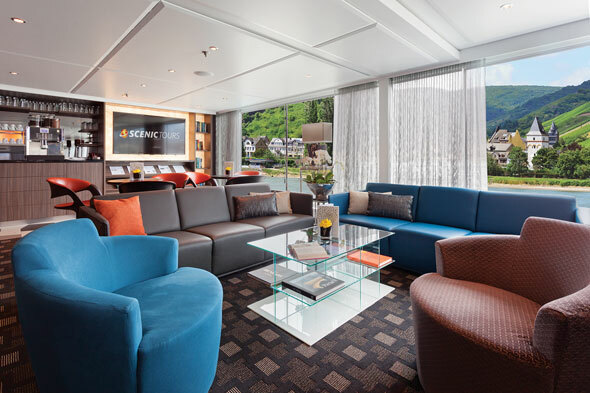 The lounge is the focal point of life on board, a space that extends from the gangplank reception area right to the bow, where a number of tables allow for al fresco drinking and dining. It serves as a coffee lounge (decent espresso machines 24 hours a day), bar and entertainment venue (later in the week echoing, worryingly for those of a nervous disposition, the full-blooded attack of a troupe of Hungarian folk dancers). Dinner is usually at 7.30pm but on our evening in Vienna it’s brought forward to 5.30pm so we can enjoy one of the events that Scenic is noted for in its Scenic Enrich programme: a private concert at the elegant Palais Liechtenstein. The dock in Vienna is a couple of miles from the centre so we get a coach ride to the privately-owned palace situated behind enormous gates. 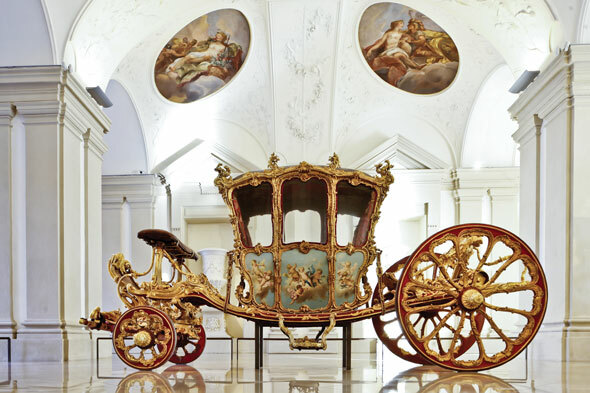 There’s a feeling of the grand old days of Europe as we cross the courtyard and enter a world of stucco, pillars and marble and are presented with complimentary Champagne – and not just one glass, either. Our concert is up a grandiose staircase, in the Hercules Hall, with a glorious ceiling fresco by Baroque master Andrea Pozzo. A 10-piece orchestra on a dais plays Strauss’s Blue Danube, Mozart’s Night Music and a string of other favourites with verve – there are cameos by an opera singer and even a couple of ballet dancers. It’s the sort of thing you’d pay a godly sum for, yet it’s all free. Back on board we’re treated to a soup supper and I sip a brandy, again included. 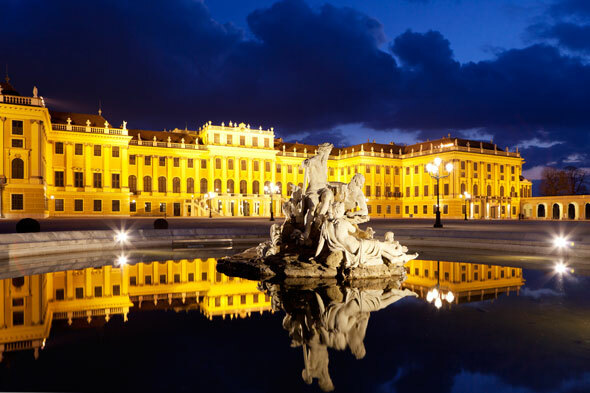 The following day I join the tour of the Schönbrunn Palace, which involves walking through its gilded rooms with a local guide, followed by free time in its vast grounds. I wander among the huge trees, the faux Roman ruins and up to the hill where the Gloriette, an extravagant collection of arches and statues, gives views of the city. Scenic’s coaches also operate a shuttle service into town and, after popping back for lunch (more Austrian specials including a blood sausage hash), we also have time for an hour in the city, to walk through St Stephen’s Cathedral, gaze out of the windows into the Spanish Riding School and grab an ice-cream at the café Eissalon am Schwedenplatz, near the banks of the Danube canal, an enormous place with outside seating and giant sundaes. No sooner are we back on board then we’re off, into pastoral scenery with cottages and fishing huts perched on stilts to protect them from the unreliable waters. We’re quickly into a huge lock that blots out all light in my room, so close is the concrete wall. The best views are from the top deck; a promenade that runs from one end of the ship to the other where the big choice is whether to go for a sunlounger or a deckchair. There’s not a lot else to explore on board, although there is a small gym with smart equipment and spa-like décor. My room is a pleasing place to retreat to, and one of the few places where you’ll find a free mini-bar, stocked daily with not only wine and miniatures but also crisps and chocolate. Everyone gets a butler; mine is called Stan who brings me anything from a morning cocktail to a midnight steak. Evenings start when everyone gathers in the lounge for drinks before being invited downstairs to the big airy dining room. 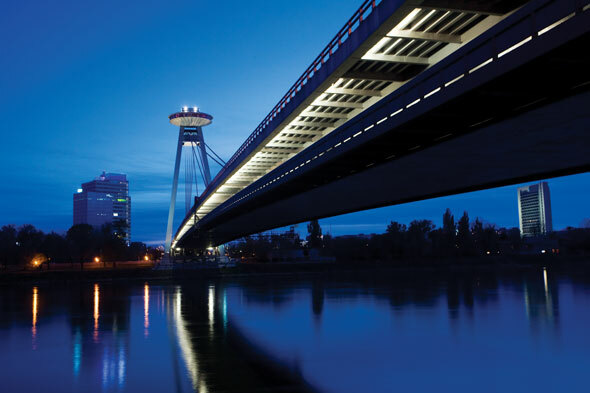 The sun drops and it’s here that we get our next surprise; suddenly the banks are lit up and we’re passing through Bratislava. The next surprise is waking up as we arrive in Budapest. It’s one of those iconic river cruising sights but until you do it you can’t appreciate the power of docking opposite the Baroque parliament building, the spring sun glinting off the expansive river and the gold of the roof’s domes. Today’s options are a city tour, a visit to one of the thermal baths or a trip to the Hospital in the Rock museum. I choose the latter but it becomes a city tour in itself, taking in the views from the hilltop Citadel (including Scenic Jade), dropping others off at the Baroque Széchenyi baths, some of the largest of their kind in Europe, and walking around the lofty old town on the Buda bank. The museum is a Second World War German hospital built into the hill, using caves formed by the natural hot springs. The complex was later a rebel hospital in the 1956 anti-Communist uprising and a nuclear bunker during the Cold War. Instead of getting the coach back I walk through the tiny, cobbled streets back to the ship where I sun myself on deck for the rest of the afternoon, marvelling at the scenery. That night is our big dinner where I’m invited to dine at the Table la Rive. On a ship where everything is included, this is something only for suite guests, a table for eight in the centre of the dining room. We’re surrounded by a silver chiffon curtain which, depending on your outlook, gives us a certain decadent privacy or cuts out the views. We have our own pair of waiters who serve us our six-course menu, with a different wine for each course, kicking of with a salty lemongrass crème brûlée, which sets the tone for the evening – including salmon carpaccio with warm pine nuts, steak with olive oil and foie gras and a chocolate cake with balsamic cherries and bourbon vanilla ice-cream. It’s all I can do to make it into the bar to listen to the Hungarian trio play The Third Man Theme and sample the slivovitz, the local plum brandy. But it’s not over yet. We set off on an evening cruise through the city, past the twinkling lights and under the bridges. I watch first from deck and then slip back to my conservatory, the ultimate private view, slivovitz in hand. Scenic Tours’ 15-day Jewels of Europe cruise, between Amsterdam and Budapest is from £2,495, all-inclusive, with flights, transfers and excursions. 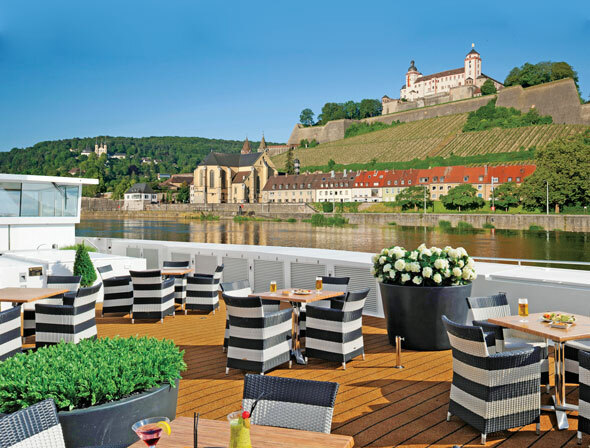 The eight-day Gems of the Danube, between Nuremberg and Budapest, is from £1,895. For more information call 0161 236 2444 or go to scenictours.co.uk.